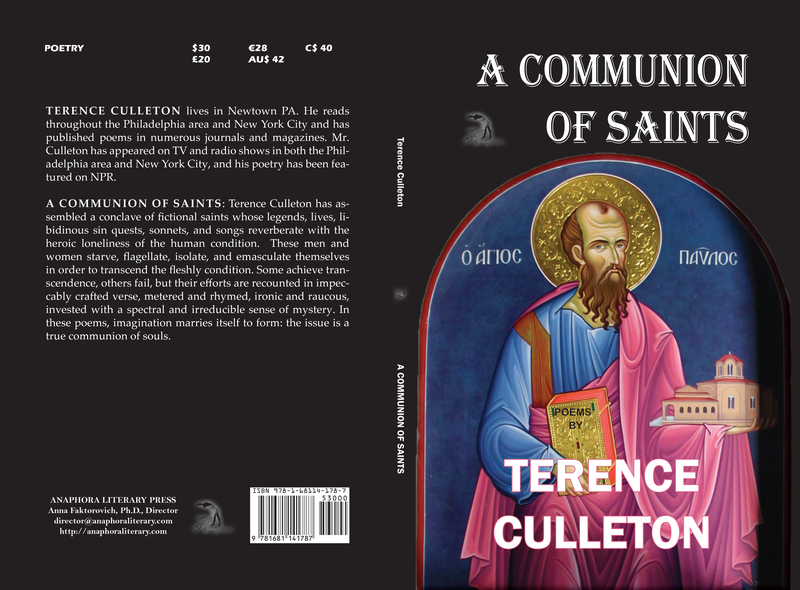 A Communion of Saints ($15 – Click to Purchase, ISBN: 9781937536053, Hardcover ISBN: 978-1-68114-178-7, 6X9″, 76pp): Terence Culleton has assembled a conclave of fictional saints whose legends, lives, libidinous sin quests, sonnets, and songs reverberate with the heroic loneliness of the human condition. These men and women starve, flagellate, isolate, and emasculate themselves in order to transcend the fleshly condition. Some achieve transcendence, others fail, but their efforts are recounted in impeccably crafted verse, metered and rhymed, ironic and raucous, invested with a spectral and irreducible sense of mystery. In these poems, imagination marries itself to form: the issue is a true communion of souls. 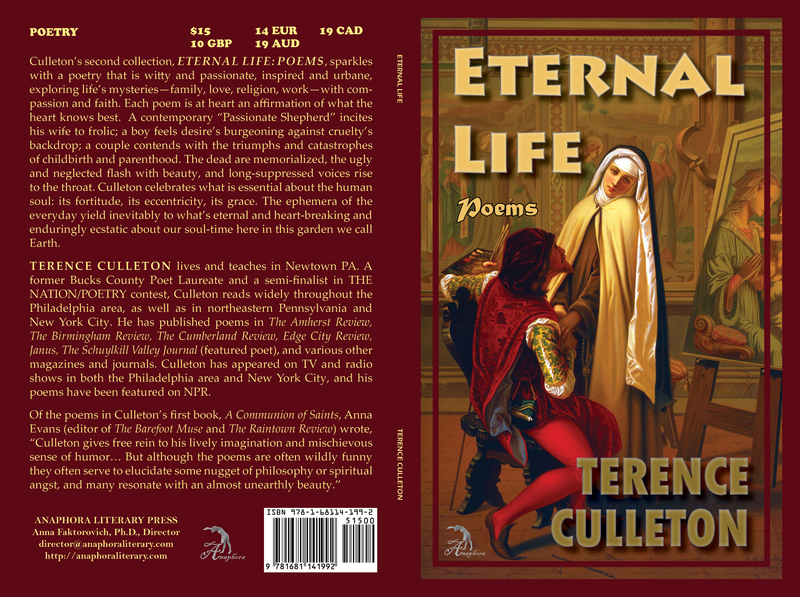 Eternal Life: Poems: ($15, 68pp, 6X9″, Print ISBN: 978-1-68114-199-2; $2.99, EBook ISBN: 978-1-68114-200-5, LCCN: 2015913870, September 2015; Purchase on Amazon or Barnes & Noble): sparkles with a poetry that is witty and passionate, inspired and urbane, exploring life’s mysteries—family, love, religion, work—with compassion and faith. Each story is at heart an affirmation of what the heart knows best. A contemporary “Passionate Shepherd” incites his wife to frolic; a boy feels desire’s burgeoning against cruelty’s backdrop; a couple contends with the triumphs and catastrophies of childbirth and parenthood. The dead are memorialized, the ugly and neglected flash with beauty, and long-suppressed voices rise to the throat. Culleton celebrates what is essential about the human soul: its fortitude, its eccentricity, its grace. The ephemera of the everyday yield inevitably to what’s eternal and heart-breaking and enduringly ecstatic about our soul-time here in this garden we call Earth. Terence Culleton lives and teaches in Newtown PA. A former Bucks County Poet Laureate and a semi-finalist in THE NATION/POETRY contest, Culleton reads widely throughout the Philadelphia area, as well as in northeastern Pennsylvania and New York City. He has published poems in The Amherst Review, The Birmingham Review, The Cumberland Review, Edge City Review, Janus, The Schuylkill Valley Journal (featured poet), and various other magazines and journals. Culleton has appeared on TV and radio shows in both the Philadelphia area and New York City, and his poems have been featured on NPR. This is an ambitious conceit and a beautifully written book. Among all the books of poetry available, I am delighted to own this one.